QuickBooks makes it easy to create your balance sheet with the pre-installed balance sheet template. QuickBooks lets you organise and review your balance sheets, financial data and other financial reports anytime and from anywhere in one place. The balance sheet shows what a business owns, the asssets, what it owes, the liabilities, and its net worth at a specific point in time. The three parts of a balance sheet are assets, liabilities and equity. It has two sections that must balance, hence the name balance sheet. The balance sheet, together with the income and cash flow, is the main report for any business. In fact, the balance sheet is the core component of other financial statements as all others either feed into or are derived from it. QuickBooks organises all of your business's accounting and financial data in one location so that you can create financial reports like the balance sheet in just a few clicks. QuickBooks offers a pre-installed balance sheet template and does all the necessary calculations for you, making it fast and easy to access and review your balance sheet. 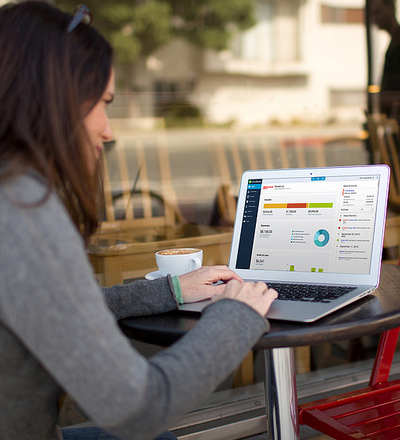 QuickBooks allows you to access and generate over 65 financial reports and statements in minutes. The main categories of assets are listed first in the balance sheet, followed by the liabilities. The difference between assets and liabilities is displayed at the bottom as the equity or net worth of the business. Simply choose Reports > Balance Sheet in QuickBooks and the pre-installed template is populated with your data in seconds. Balance sheets can you help identify and analyse trends in your business, especially for accounts receivable and accounts payable. Are your customers paying on time? Can you collect overdue invoices more effectively? Do you have any "bad debts" - debt that you can't collect? The balance sheet provides you with the financial information you need to effectively manage the business's financial health. QuickBooks Online requires a computer with either Microsoft Windows (XP, Vista, Window 7, or Windows 8) or Mac OS 10.7.4, an Internet connection (a high-speed connection is recommended), and at least Microsoft Internet Explorer 10, Firefox, or Chrome for Windows or Safari 6 for Mac. The QuickBooks Online mobile app works with the iPhone, iPad, and Android phones and tablets. QuickBooks Online is accessible on mobile browsers on iOS, Android, and Blackberry mobile devices. Devices sold separately; data plan required. Not all features are available on the mobile apps and mobile browser. QuickBooks Online mobile access is included with your QuickBooks Online subscription at no additional cost. Data access is subject to cellular provider network availability and occasional downtime due to system and server maintenance and events beyond your control. Product registration required. Terms, conditions, pricing, features, service and support are subject to change without notice. Standard message and data rates may apply. iPad and iPhone are trademarks of Apple Inc. Android is a trademark of Google Inc. Microsoft and Windows are either registered trademarks or trademarks of Microsoft Corporation in the United States and/or other countries.